If you're unfamiliar with the music of Jonathan Coulton, he has conveniently posted a large collection of it here, which you can listen to at your leisure, for FREE. Awesome, huh? I think it is, but I'm a huge fan of his particular brand of humorous, catchy soft-rock tunes that absolutely beg to be sung along to. Especially when you're driving in your car. Or taking a shower. Or when no one else is home but the dog, who is only too happy to dance along with you in the living room. Which, in case you're wondering, is something I never do. Honest. Mr. Coulton (I don't know him personally) first came to my attention with the song "Code Monkey" -- a kind of anthem for programmers everywhere -- but my personal favorites are the love song "You Ruined Everything," the sad-sack lament "Big Bad World One," and the scandalously funny "First of May." By the way, some of these songs are available for FREE download from Mr. Coulton's website (just click on the links). As a comic lyricist, he is especially good at unreliable narration -- that is, his songs are often from the point-of-view of the less-than-heroic, such as "Re Your Brains," which is sung from the persona of a zombie explaining his newfound hunger to a former coworker. Also, there's the amazingly catchy "I Hate California," which slams the Golden State for rather oblique reasons. For the gamers amongst you, he even penned "Still Alive" -- a little ditty sung from the persona of the murderous artificial intelligence from the game "Portal." As you can probably discern, Coulton is a self-proclaimed geek, which I think only adds to his charm. But the comic nature of his lyrics shouldn't lead you to think his songs are novelty creations. Coulton has a rock-pop soul, and he crafts guitar-driven melodies that stay with you. The aforementioned "You Ruined Everything" is a song I find myself humming all the time. And "Big Bad World One" used to comfort me immeasurably (in a commiserating kind of way) on my long commutes to & from my own wage-slavery. Besides his enjoyable musical creations, Mr. Coulton appeals to me in another way: he is an independent artist who has skillfully used the internet both to promote himself & his work and to maintain a direct connection to his audience. Through the use of his website and social media, he obviates the need to indenture himself to anyone (like one of those big, vertically-integrated media multinationals who pay the RIAA to sue college kids) to further his career. He blogs regularly on his site, and a recent entry featured this YouTube video of a performance "Mr. Fancy Pants" that turned into a kind of musical duel with the singer/beat-boxer/live-looper Kid Beyond. Recognizing the importance of promotion, Jonathan Coulton gives away much of his music for FREE, relying on touring & a kind of "internet patronage" for his living. By "internet patronage," I mean direct payments from his fans via his website, as either donations (via Paypal) or as purchases of his music or merchandise. Which I think is savvy as hell. This direct connection between artist and consumer is, to my mind, the way of the future, especially as technology continues to put more & more power & capability into the hands of individuals. After all, why would you need a record company (a) to ensnare you with an advance into a contract for the rights to your work, (b) to book studio time for recording, (c) manufacture products of your creation for distribution, (d) promote those products for sale, and (e) manage a tour, when you, as an autonomous artist, can do it all yourself with your laptop and a minimum of equipment? 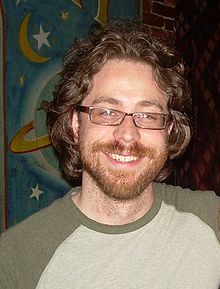 So, as both artist and business-man (and geek), Jonathan Coulton is someone I admire & support. Once you listen to his music, I'm betting you'll feel the same. I'm just hoping he comes to Las Vegas so I can catch his performance live.